STURGIS | For four decades, the Northern Hills Drug and Alcohol Services treatment facility has been helping addicts get their lives back on track from sites in Black Hawk and Sturgis. Three months ago, the treatment center changed its name to Compass Point, and now it has expanded and centralized its services into a pair of buildings on Williams Street in Sturgis. 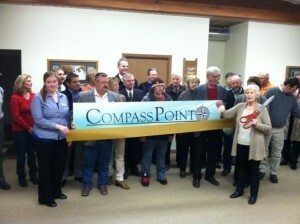 Compass Point held a grand opening of its new in-patient treatment center next to its existing out-patient center Thursday. The private, non-profit agency had been renting space for its in-patient center in Black Hawk, but will now provide those services in its brand new building that is next door to the former school where its out-patient clinic is located. Those expanded services will include more adolescent drug and alcohol prevention programs, and a women’s treatment group, Wood Fossen said. In addition to its intensive in-patient and out-patient programs, Compass Point also hosts the local drug court program, she said. Compass Point serves 85 in-patient clients a year, and performs about 800 patient evaluations each year, Wood Fossen said. The new digs are at 1807 and 1809 Williams St. in Sturgis; call 605-347-3003 for more information.